Mayor Andrew Ginther (center) plus others help The Woda Group, Inc. cut the ribbon at the grand opening of Wheatland Crossing in the Hilltop of Columbus, OH. See list of participants below. Westerville, OH, December 12, 2017 – A new 42-unit, $8.6 million affordable senior housing community called Wheatland Crossing Senior Apartments is now open in near west side Hilltop area Columbus. To celebrate the grand opening, developer The Woda Group, Inc. hosted an open house event and ribbon-cutting themed, “Home for the Holidays” on Friday, December 8, from 11 AM to 1 PM. Wheatland Crossing, developed for residents 55 and older who earn 60% or less area median income, is supported in part by federal Low Income Housing Tax Credits and Private Activity Bonds provided by the Ohio Housing Finance Agency (OHFA). 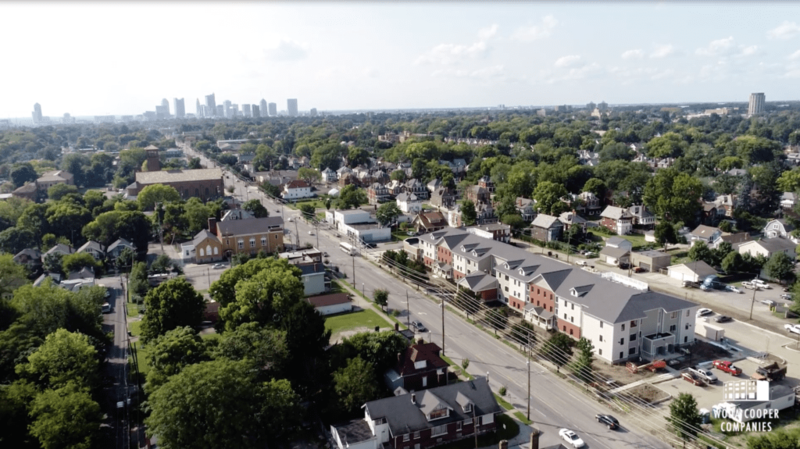 The City of Columbus contributed a Housing Preservation Bond Grant and Homes on the Hill – Community Development Corporation (HOTH-CDC) is coordinating supportive services. Partnerships between private and public entities who collaborate to create much-needed affordable housing like Wheatland Crossing, “are absolutely critical now and will be even more in future,” Mayor Ginther added. Iretta Lathon and her husband, Tony, were among the first residents to in move to Wheatland Crossing in mid-November. Lathon said she was thrilled to participate in the ribbon-cutting event and is happy to live in the new development. “It makes me feel proud of the community where I live, and gives me hope for better days,” she said. Wheatland Crossing is a three-story attractive building nestled within a park-like campus at 216 N. Wheatland Avenue. It has a combination of one- and two-bedroom units. Each unit has a bright, open concept living space, individually-controlled heat and air conditioning, washer-dryer hookups, and Energy Star appliances. There is a multipurpose community room, onsite management office, a wellness room for use by health professional visits, and laundry facilities. There is also an outdoor sitting area and an onsite bocce ball court. Wheatland Crossing has several units with handicapped accessible features including roll-in showers and other universal design elements. It is expected to be certified LEED Gold, and it was designed and built to meet the City of Columbus and Franklin County AWARE green and universal design manual and performance standards. The primary source of funding for Wheatland Crossing was made possible through the allocation of housing tax credits, bonds and other loans from OHFA, including $1 million in Ohio Housing Trust Funds. The Ohio Capital Corporation for Housing (OCCH) invested approximately $4.1 million in equity for the housing tax credits, with Huntington National Bank serving as the secondary investor. Key Bank provided $4.6 million in construction financing and the Affordable Housing Trust of Columbus and Franklin County provided a bridge loan of $2.5 million. The City of Columbus pledged $500,000 through a Housing Preservation Bond Grant. “This building is proof of what bonds and tax credits can accomplish and the value of public/private partnerships,” said Thomas. Mr. Hal Keller, President of OCCH, said new housing developments contribute toward prosperity in local neighborhoods by creating new jobs and spurring the purchase of goods and services by residents and property owners. “Economic development and affordable housing go hand in hand,” he said. Expressing commitment to affordable housing on the part of financial partner Huntington National Bank, Mr. Yianni Vitellas said, “Huntington Bank is a proud investor in Wheatland Crossing. It takes all of us coming together to assure good quality affordable housing.” Vitellas, a Senior Vice President- Portfolio Risk Manager for Huntington, also announced the bank recently committed $150 million toward future affordable housing projects. Woda’s affiliate Woda Management & Real Estate, LLC, will oversee day-to-day management. Services such as daily meal services, health and wellness screenings and referrals, planned social activities, financial and credit counseling and other supports will be coordinated by HOTH-CDC. “It is wonderful to see this beautiful building when you drive down Wheatland Avenue. We are proud to be part of it,” said Daniel Ruggiero, Counseling & Education Program Director for HOTH-CDC. Additional support for health and wellness programs will be delivered through LifeCare Alliance. The Woda Group, Inc. has offices in Westerville, Ohio; Annapolis, Maryland; Savannah, Georgia; Shelbyville, Kentucky; Norfolk, Virginia; Indianapolis, Indiana; and Mackinaw City, Michigan. For more information, call (614) 641-3200 or visit www.wodagroup.com. Mayor Andrew Ginther is greeted by Woda’s John Hardiman (right) and Joseph M. McCabe (center). From left: Sean Thomas, Mayor Andrew Ginther, Jeffrey Woda and Joseph M. McCabe. Leslie Taylor of Woda Management & Real Estate LLC greets guests at the Wheatland Crossing grand opening. Caption for feature photo above: From left: Marcus Gordon, John Hardiman, Woda Management & Real Estate, LLC; Jeffrey Woda, Principal, The Woda Group, Inc; Daniel Ruggiero, Homes on the Hill-CDC; Yianni Vitellas, Huntington National Bank; Sean W. Thomas, Ohio Housing Finance Agency; Mayor Andrew Ginther; Iretta Lathon, Resident; Hal Keller, Ohio Capital Corporation for Housing; Joseph M. McCabe, The Woda Group, Inc.; Aaron Murphy, The Affordable Housing Trust for Columbus and Franklin County; Ellen Short, Office of Senator Sherrod Brown and Kelly Frank, Key Bank.